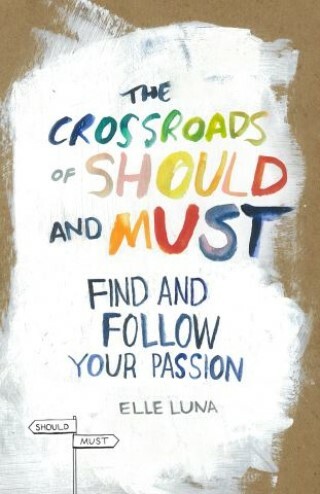 Who hasn’t asked the question “How can I find and follow my true calling?” Elle Luna frames this moment as “standing at the crossroads of Should and Must.” “Should” is what we feel we ought to be doing, or what is expected of us. “Must” is the thing we dream of doing, our heart’s desire. And it was her own personal journey that inspired Elle Luna to write a brief online manifesto that, in a few short months, has touched hundreds of thousands of people who’ve read it or heard Elle speak on the topic. Now Ms. Luna expands her ideas into an inspirational, highly visual gift book for every recent graduate, every artist, every seeker, every career changer. The Crossroads of Should and Must has a universal message—we get to choose the path between Should and Must. And it gives every reader permission to embrace this message. It’s about the difference between jobs, careers, and callings. The difference between going to work and becoming one with your work. Why knowing what you want is often the hardest part. It gives eye-opening techniques for reconnecting with one’s inner voice, like writing your own obituary (talk about putting life in perspective). It talks about the most common fears of choosing Must over Should—money, time, space, and the ultimate fear: total vulnerability—and shores up our hesitation with inspiring stories of and quotes from the artists and writers and thinkers who’ve faced their own crossroads of Should and Must and taken the leap. It explains the importance of mistakes, of “unlearning,” of solitude, of keeping moving, of following a soul path. Presented in four chapters—The Crossroads, The Origin of Should, Must, and The Return—inspired by the hero’s journey outlined by Joseph Campbell, The Crossroads of Should and Must guides us from the small moment, discovering our Must, to the big moment—actually doing something about it, and returning to share our new gifts with the world. Elle Luna is a designer, painter, and writer. She facilitates a global art movement, #The100DayProject, where creators make every day for 100 days, and has previously worked as a designer at IDEO and with teams on apps and websites, including Medium, Mailbox, and Uber. Ms. Luna speaks to groups around the world sharing the story of The Crossroads of Should and Must. She lives in San Francisco and online at www.instagram.com/elleluna.